One of the best ways for GP14 sailors to maximise enjoyment of their GP14 is to join the Association and help support it’s work. 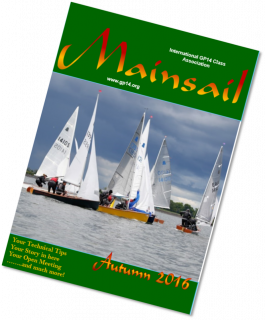 Membership of the Association is inexpensive and provides many benefits to GP14 owners. If you are not already a member, please join us today. GIFT Membership – New for 2019! Why not buy your crew, partner friend etc. an annual membership of the Association as a gift! Visit the Shop to buy it! The International GP14 Class Association coordinates support for GP14 sailing worldwide, including in the UK, where we are represented on the Association committee by a number of key volunteers, including Area Representatives. The extensive work of the committee depends on the support of GP14 sailors and your membership of the International Class Association. Also, the work of our volunteers and Area Representatives means we are able to offer many benefits. It is therefore crucial that all sailors around the world support their International Class Association by joining us. While for some membership simply provides an opportunity to share an absorbing hobby with friends, for others it is the route to fulfilling their sporting ambitions. Many of the World’s successful sailors learnt to sail in a GP14, including Ellen MacArthur and several winners of other national and international classes such as the Admirals Cup and the Olympics. Membership presents an opportunity to make new and lasting friendships, both in your home country and throughout the World, whilst taking part in one of the greatest sporting activities on earth! Grants and Funds – The GP14 Association supports members through Grants and Funds. Class Rules – protecting the one-design status of the GP14 and controlling maximum prices. This helps to promote fair racing and maintain the value of GP14 boats. Particularly if you are new to GP14 there is a lot of helpful information on our Members page “All About your GP14” and in our very active Forum. Website and emails – provide access to a huge amount of information at the click of a button, including a large “Members” section containing lots of helpful hints.